They look all right in photos, but DoCoMo's newest phones are a hefty bunch. The last year or so seems to have seen an inordinate amount of coverage by the Western media of Japanese mobile phones like the new 905i series from NTT DoCoMo that was unveiled here in Tokyo yesterday. Admittedly, we've been guilty of covering a lot of these handsets you'll never see in the West, but have mainly focused on the incredibly useful stuff in the newest phones, such as the wonderful things the companies are doing with RFID and e-cash. One thing we've almost never done is to praise the design of phones here and that's for one very good reason - they're almost all hideous. 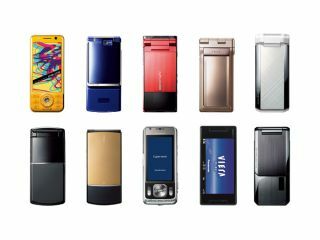 On a personal level, a recent post on Gizmodo by Adam Frucci was one of the very few I've seen to dissent from the 'Aren't Japanese phones amazing?' line and I was glad to see someone open their eyes on a visit here. Conversely, my pal Sumner Lemon of IDG was clearly taken with the one decent handset I've seen recently, KDDI/au's Infobar 2. Nice as it is, it sure ain't no iPhone rival. In fact, the preponderance of thick, garish clamshell and slider handsets is such that it's becoming one big yawn-fest covering the mobile market here, which is why we didn't attend yesterday's 905i series launch, to which DoCoMo kindly invited me. I hope you'll forgive me, but we just felt there were more newsworthy stories to cover. Sure, the new phones have some good features like international roaming and digital TV as standard across the board, but so what? There's nothing particularly new (roaming) or useful (TV) about those, is there? Then just look at the size and weight of these things - can't we just have a light, slim handset that has the useful stuff and then maybe forget about the constant one-upmanship that leads the Japanese networks to demand makers cram more and more into their ugly little plastic toys? DoCoMo's more basic 70x series is a nod in the direction of the simple life, but efforts so far leave too much to be desired, with many of them feeling flimsy and cheap. Maybe it's just me - perhaps 150g handsets with 5-megapixel cameras, 7.2Mbit/s HSPDA, earthquake alerts, motion detectors and plenty more besides are what people want, but give me something as elegant as anything recent by Motorola or Nokia, stick an IC chip in it and I'll shut up.